One nice thing about living in a small state is that it's easy to visit ALL the attractions! Through our years of homeschooling we have tried to visit just about every place we can in our state. We enjoy taking frequent trips and with summer winding down this is the time that we start planning where we'd like to go in the fall. Many of these are places that we have been to over and over again and while we may be outgrowing a few of them they are still great fun for families. If you are planning an end of summer trip to the Nutmeg state these are some of what we consider the "must see" attractions. 1. We always have a great time when we visit Mystic Aquarium. It is one of our favorite family attractions. 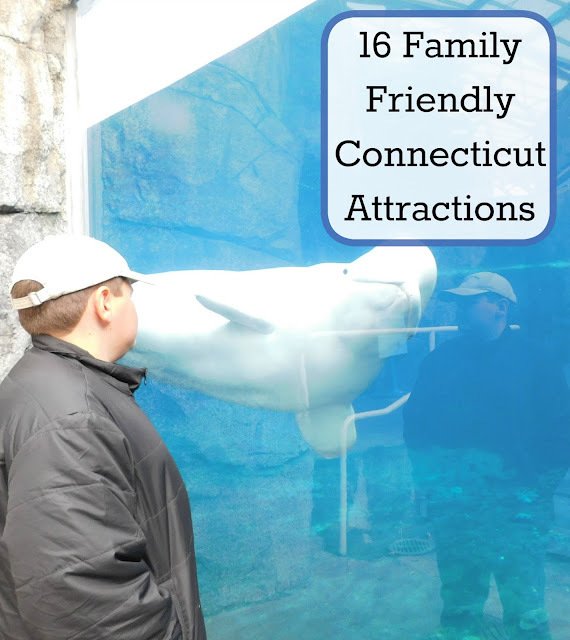 The beluga whales are always entertaining, plus we get to sit though a fun seal lion show, watch penguins swimming around, and touch sharks, rays, and reptiles! 2. My boys enjoy challenging themselves while visiting the Storrs Adventure park. With multiple aerial courses to choose from there is something fun for everyone. 3. The New England Air Museum is perfect for budding historians or anybody that is interested in things that fly! My boys have so much fun checking out the planes, helicopters, and war paraphernalia and enjoy trying their hand at flying using the flight simulators. 4. We enjoy each and every trip to the Connecticut Science Center. With three floors of ever changing exhibits and hands on fun it's a great way to pack in some learning with lots of family fun. 5. We learned so much about the famous writer Mark Twain when we toured the Mark Twain House. The house is filled with family antiques and we got to see the actual desk where he wrote many of his famous books. 6. Mystic Seaport-- We always have a great time at this living history museum. My boys have gotten to try blacksmithing, harpooning, and navigating. We've toured whaling ships and checked out what life was like in a rural New England Whaling village. 7. My boys were amazed at the actual dinosaur footprints found on the floor at Dinosaur State park. We also got to learn about prehistoric plants and animals and got to see so many fossils. 8. The Mashentucket Pequot Museum taught us so much about life living on an Indian reservation and the struggles of the Mashentucket Pequot tribe. 9. Beardsley Zoo is Connecticut's only zoo and we just loved visiting. We saw so many adorable animals and enjoyed walking through the greenhouse and the mini carousel museum. 10. Quassy Amusement park, while not the largest amusement park in Connecticut is one of our family's favorites. The park is small, clean and not usually super crowded. It is situated on a lake with a swimming area and a water park too! The rides are great for younger kids and those that don't love major thrill rides. 11. The Natuliss submarine and museum is a completely free attraction that teaches about the history of submarines; most of which are built right here in Connecticut. 12. Tour a Cider Mill in the fall or a Maple Sugar Shack in the Early Spring. These two activities are found throughout most of New England and to me just capture the feel of living in New England. 13. Visit Gillette's Castle. We had a wonderful time touring one of Connecticut's "castles" and learning more about the life and work of William Gillette (the actor who first played Sherlock Holmes). 14. Visit the beach! Our favorite Connecticut beach is Rocky Neck since there are not big waves and when the tide goes out we can walk forever. We also get to try crabbing and enjoy looking for birds in all the marshes. 15. 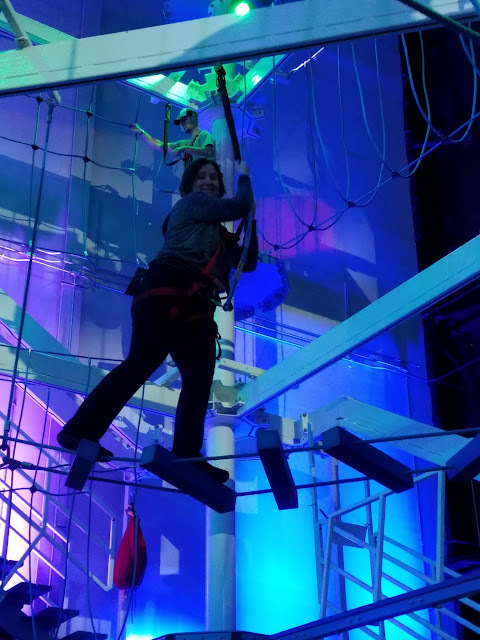 It adventure ropes course inside Jordan's Furniture or Soar Indoors. My boys love climbing and these two indoor adventure courses each offer a different experience. 16. The West Hartford Children's Museum is a wonderful museum for children and families offering lots of hands on exhibits, a butterfly conservatory (in the warmer months), live animals, and wonderful educational movies in their planetarium.